There is a new, lower-cost option coming for the WP e-Commerce Plugin. It launched in April 2012 and is called: “PayPal Payments Advanced” and it will soon be a great option for WordPress ecommerce. Up till now you had to pay the full “PayPal Payments Pro” $30/month fee. But soon this new $5/month option will give you almost all the same features. WPEC does not support this new gateway yet but I think soon we will see more integration for “PayPal Payments Advanced”. There is an option to use PayPal’s API to set up a gateway now but there is a greater efficiency in waiting for the community to fully support ongoing maintenance of that gateway. As far as I can tell now, “PayPal Payments Advanced” will not give the fully seamless experience that “pro” offers. PayPal will have some of its branding on the checkout page. Here’s the screenshot that PayPal provides in their API PDF. If users choose to fill out this payment form they stay on the store site. If they click “pay with my PayPal account” the go off to paypal.com. So this is not as professional of a solution but it’s close and for smaller stores it will be a welcome choice. “PayPal Payments Pro” also gives you Virtual Terminal but you can get that same functionality via Square Up for no monthly fee (and they don’t even charge a fixed fee beyond the 2.75% as long as a physical card is present although the forthcoming PayPal Here will do the same at 2.7%). I look forward to the day that Square offers an online payment gateway but no word on that yet. Now one thing to keep in mind is that the names of these PayPal accounts are very confusing. “Website Payments Pro” used to be the name and now it’s called “PayPal Payments Pro”. Not to be confused with the simpler (older) WPEC gateways “PayPal Express Checkout” and “PayPal Payments Standard”. …we’ve dropped the word “website” from our U.S. product names. In the same way that Apple did when it dropped “computer” from its name in 2007 to represent its move beyond the Mac to a comprehensive consumer electronics company, this name change represents our move away from our online heritage to the future of PayPal and the multi-channel nature of payments in the new retail environment. Note: Website Payments Pro includes Direct Payment, Express Checkout, and additional PayPal solutions and tools, such as Virtual Terminal, Fraud Management Filters, and reference transactions. 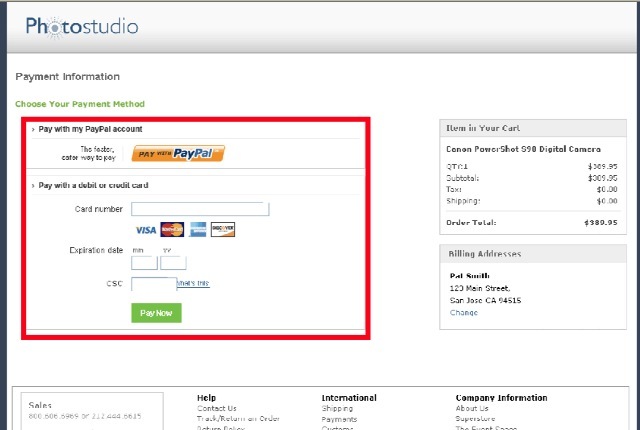 I don’t know if anyone else has noticed, but I am now seeing the PayPal cart on some of the shopping networks! E-commerce has finally come to the TV screen. Now only if they could develop a PayPal debit card that you could use in stores to deduct from your PayPal account. My wife added PayPal as a form of payment about two months ago and we have noticed sales have increased with it. People may complain about some of the fees associated with it, but I don’t think it is that bad. They are making online transactions easier and they only charge you when a sale is made. I’ve had a PayPal debit card since 2009. Pulls money directly from my paypal balance and has a pin and visa logo so i can treat it as an atm card and get some cash whenever i need it. So how does one setup this $5 paypal advanced option in WPEC? Which gateway option do you configure in WPEC? Payments Pro? I have not used it in WPEC. I am starting to use Stripe.com on all my sites.